More and more schools are breaking away from traditional school models to try new approaches that educators hope will engage students and stimulate a life-long love of learning. Often the most adventurous experimenters are in struggling schools where it is obvious that the status quo is failing students. Radical shake-ups at “high-achieving” schools are less common -- it’s hard to see the need for change when test scores are high and kids are getting into prestigious colleges. But disengaged and bored students are found even at successful schools; kids are just more adept at jumping through the requisite hoops to achieve what they've been told will lead to a good life. Greenwich High School in Connecticut is one such high-performing school. It is located in an affluent area with 14 percent of its students eligible for free and reduced price lunch. It's also a big school with an emphasis on testing and Advanced Placement courses. But even with its apparent success, Greenwich headmaster Chris Winters quietly tapped a select group of teachers to explore what a radically different kind of public high school experience might look like. After dreaming together a few times a month over the course of a year, the school received a grant from a local non-profit, Greenwich Alliance, so that five teachers could plan and recruit for their big experiment -- what they’re calling Innovation Lab. “It was clear from the beginning that it wasn't going to be a top-down initiative,” said Brian Walach, a math teacher and member of the Innovation Lab teaching team. 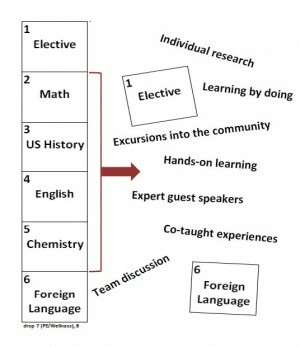 The headmaster was clear that the program had to fit within the constraints of the public school system, but otherwise he gave the teaching team freedom to come up with a program that would excite students to learn on their own, connect subject areas and dive deeply into individual passions. Freshmen at Greenwich are currently applying for 90 spots in the Innovation Lab where they will take all their math, English, social studies and science classes for the next three years (although students can opt out of the program if they don't like it). Students will study big questions that tie the subjects together -- things like climate change or logic as expressed through different disciplines. Each quarter will follow a seminar cycle where big questions are discussed, researched, deepened and connected to the real-world. 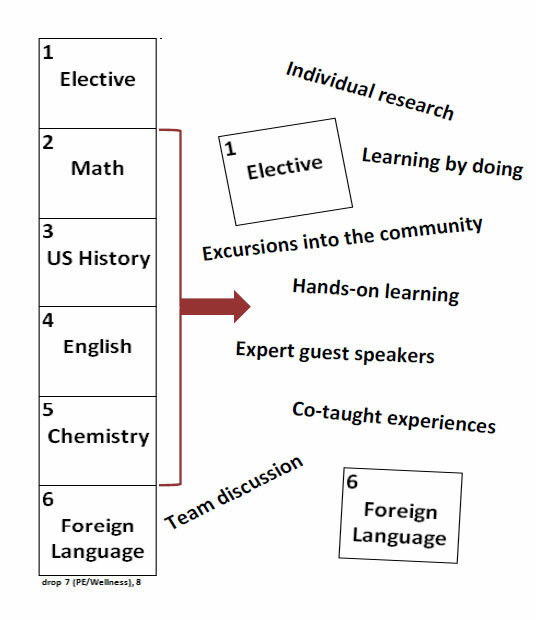 That could mean interdisciplinary discussions, modules focused on developing subject-specific skills or studio time to dig into a particularly interesting aspect that can be brought back to the group. “We can check off a ton of boxes on the stuff we need to cover while still making it interesting and connecting the dots between things,” Walach said. In this way, the Innovation Lab teachers expect to teach all the standards public school students are supposed to learn, but without following a pacing guide or textbook. 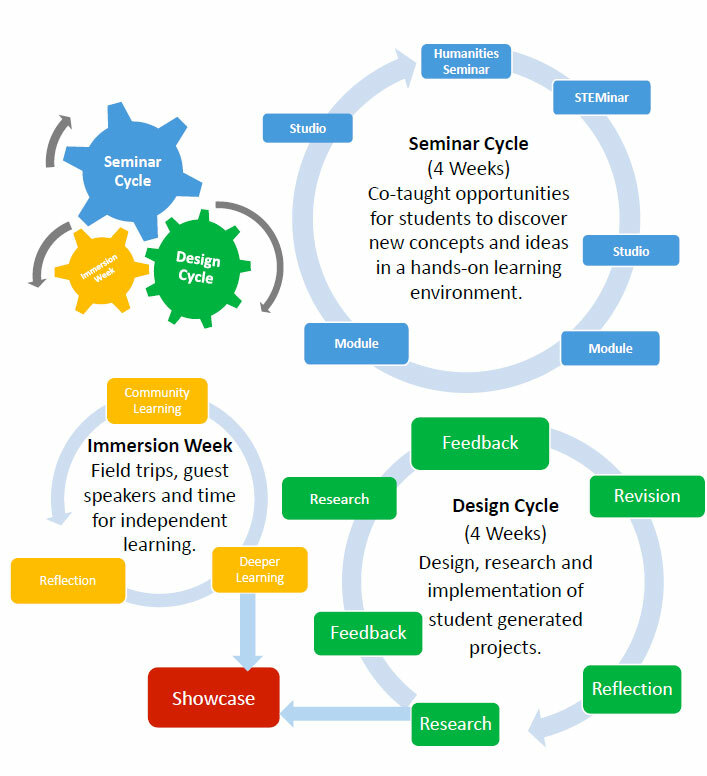 The seminar cycle will take four weeks of the quarter and is followed by an immersion week where students get to drill down on an aspect of the seminar that particularly interests them, reaching out to experts in the field or going out to see the ideas work. “We’re looking at immersion week as a moment when students can step back from what school feels like and connect with what this looks like in the real-world and get immersed in that experience,” Walach said. After five weeks of seminar and immersion, students will get the chance to design a solution for a real-world problem they’ve identified through research and study. They’ll work independently, with support from teachers, to design and build a product that meets the need they’ve identified. At the end each will present his or her project to the group in a showcase of student-designed and built products. Climate change will be a big part of first quarter sophomore year. Together students and teachers will examine questions like: how do mathematicians and scientists differ in how they make claims about the empirical evidence of climate change. Students will analyze climate science data, which Walach says involves a lot of Algebra II concepts, and discuss how climate deniers construct their arguments. In social studies, they’ll look at how policy arguments are formulated, how that logic works in comparison to something like a mathematical proof, and how logical frameworks from various disciplines are different from one another. 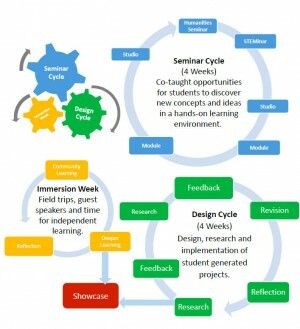 An Innovation Lab graph showing ho seminars, design and immersion in the real world work together. In English, they may look at how satire can influence both personal and political decision making. They might examine Mark Twain’s satire as an example, analyzing his critiques for facts and perception. And rather than taking a test to demonstrate understanding, the teaching team will be looking at alternate forms of applied assessment. For example, students might write and produce a satire of climate change deniers in the spirit of The Daily Show. “There’s got to be something else to make this stuff stick a little better,” Walach said. “If my goal is to have my students pass my final at the end of the year, then maybe I should keep teaching math as we are right now. But if we want students to be able to apply math to the real world, it’s not working.” He’s tired of watching students grind through school just because they know they have to show colleges a committed, consistent record. “I want to give them an experience where they get to learn something they’re actually passionate about, that’s what school’s about,” Walach said. And there were a lot of things about traditional teaching that annoyed him, like students’ obsession with grades. Math is often considered to be an outlier, not part of interdisciplinary approaches because of the belief that its linear and certain concepts must be taught before others can be broached. Walach no longer believes that. The five teachers who’ve worked to make Innovation Lab a reality know that the 90 kids who may take part are only a small portion of the more than 2,500 students at the school. But they hope to provide an example of rigorous, connected learning that doesn’t rely on traditional means like AP classes to give students interesting and challenging ways to learn. CAN THIS BE DONE ELSEWHERE? The Innovation Lab has several things working in its favor. The school is located in an affluent district and has more access to resources than many of the nation's poorest schools. The headmaster supports the effort and actively sought funding to free up some of his most creative teachers to make an idea a reality. And the team of teachers have been extraordinarily committed to creating a new reality at their school. The Innovation Lab team has worked hard to explain to prospective participants how the program fits in with the rest of school. Despite these advantages, the teaching team is adamant that this idea is replicable in public schools elsewhere if leaders identify likely teachers, give them time to dream and plan, and make sure the program is teacher-driven. They’re clear that every school has its own culture and needs that will dictate what a new program looks like. “You can’t take a model and transpose it onto a different community or a different school, but it’s important to experiment with alternative learning environments,” Golin said. This team of teachers has been convinced by visits to other non-traditional schools that have seen success reaching a wide variety of students like The Springfield Renaissance School or High Tech High. This work is happening in pockets throughout the country and educators who have jumped on board find a community of like-minded educators to support them through the experience.